Peritoneal dialysis (PD) remains an important renal replacement option for patients with end-stage renal disease (ESRD). However, as compared to other countries, PD remains underutilized in the United States. According to the US Renal Data System (USRDS) 2017 Annual Data Report, while 9.6% of all incident patients with ESRD initiated PD in 2015, only 7% of all prevalent patients with ESRD were being treated with PD in the same year. Several factors have been suggested for underutilization of PD in the US, including but not limited to: late referral of patients with CKD to nephrologists, inadequate patient education, financial disincentives, and inadequate PD education of trainees during fellowship. Does the type of health insurance at the time of chronic dialysis initiation also play a role in PD utilization in the US? A recent article by Perez et al published in AJKD examines the association between the type of health insurance and PD utilization. This retrospective study analyzed data of two socioeconomically similar patient groups that initiated dialysis between 2006 and 2012. The investigators compared patients aged 60-64 years with no health insurance (or having Medicaid only) to a Medicare- and Medicaid-eligible group of patients aged 66-70 years and determined the likelihood of PD utilization before the start of the fourth month of ESRD onset. Of note, patients in the younger (60-64 years) group were included only if they entered Medicare’s “90-day waiting period” at the time of ESRD onset. As all patients in this study became Medicare eligible after 3 months of ESRD onset, the likelihood of switching to PD after receiving Medicare was also assessed. 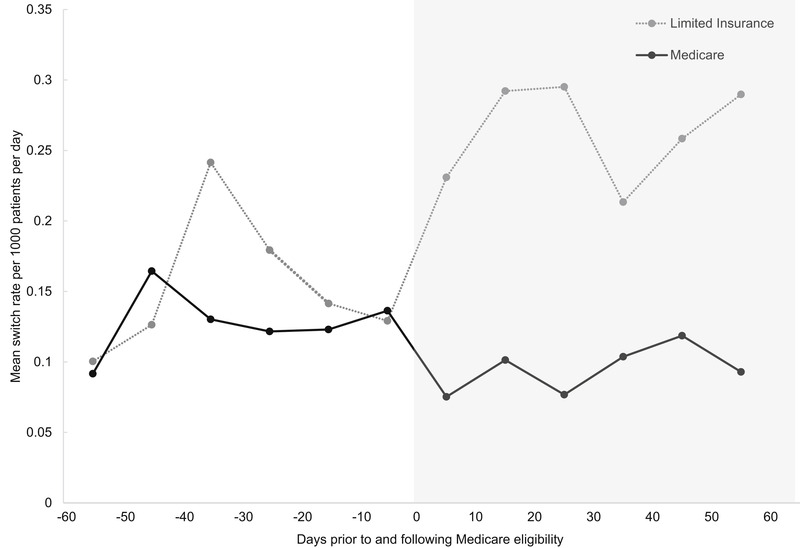 Unadjusted rate of switching to peritoneal dialysis therapy before and after Medicare eligibility based on the 90-day waiting period among patients with limited insurance and Medicare at the onset of end-stage renal disease. Figure 3 from Perez et al, AJKD © National Kidney Foundation. The results of this study should not surprise most practicing nephrologists in the US. By the fourth month of dialysis, 4.3 % of Medicare recipients utilized PD as compared to 2.7 % of patients who had no insurance or had Medicaid only (P < 0.001). While this P value may be impressive, what may stand out more is the overall low rate of PD utilization in both groups. Additional multivariable regression analysis also showed lower likelihood of PD utilization among patients with no health insurance (or Medicaid only), compared to patients with Medicare at ESRD onset. Interestingly, this association between the type of health insurance and PD utilization reversed when patients with no insurance/Medicaid only became Medicare-eligible. 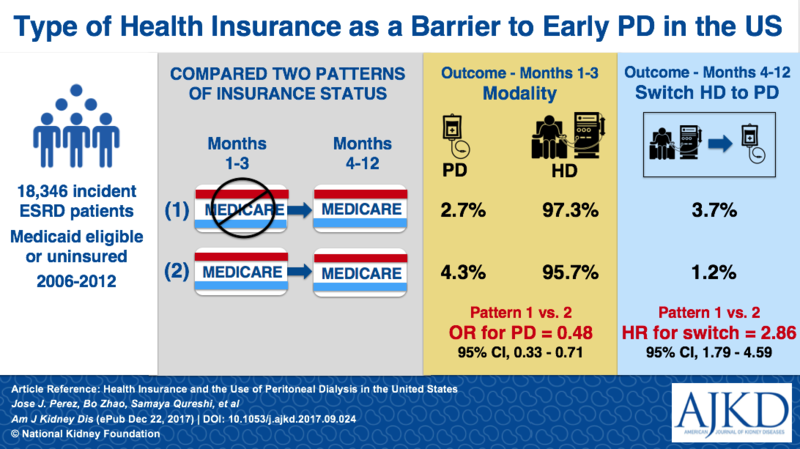 3.7% of HD patients in this group switched to PD from months 4 to 12 of chronic dialysis initiation compared to 1.2 % of patients with Medicare at ESRD onset. Additional analyses were also conducted by Perez et al including the impact of the ESRD Prospective Payment System (PPS) on early PD utilization. The ESRD PPS was enacted in 2011 in the US and this created new economic incentives for some PD providers. 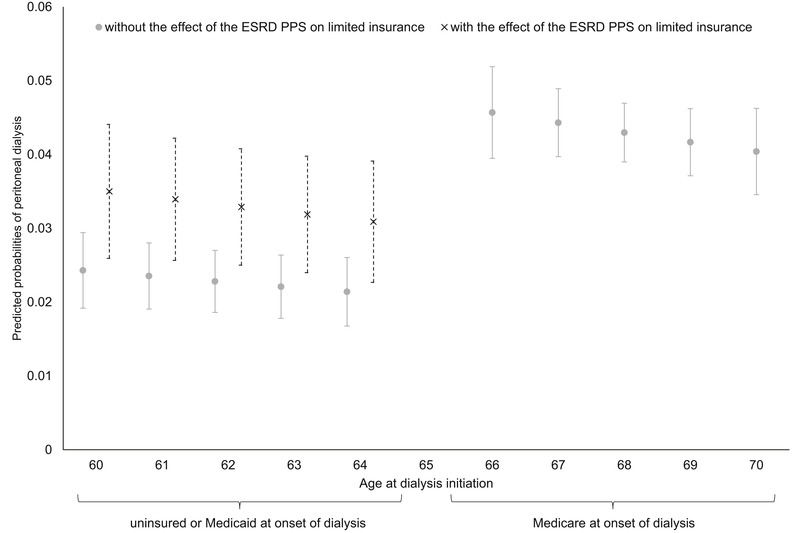 While this had led to a slight overall increase in PD utilization in the US, patients with no health insurance and Medicaid only in this study were 40% less likely to receive PD at the fourth dialysis month compared to Medicare recipients at ESRD onset. However the rate of switching to PD after the third month of dialysis did not change in these different insurance groups. Of note, this study only assessed the first 2 years following PPS enactment. It is likely that the result would have been more favorable if several more recent years of data were included. Age-stratified predicted probabilities of peritoneal dialysis by dialysis month 4 before versus after enactment of the End-Stage Renal Disease (ESRD) Prospective Payment System (PPS). Figure 2 from Perez et al, AJKD © National Kidney Foundation. Despite several limitations, this observational study does shed light on the fact that the type of health insurance that patients have during advanced stages of CKD may also play a role in initial dialysis modality. It is well known that patients with no health insurance in the US are more likely to initiate dialysis during a hospital stay and that hemodialysis (HD) would be the likely renal replacement option in this group. However, US patients who are eligible for Medicare as a result of ESRD diagnosis can receive coverage on the first day of the calendar month that they initiate PD or home HD treatment. In comparison, patients who start in-center HD treatment need to wait for 3 months to receive Medicare coverage. While this incentive may seem enticing for dialysis providers of uninsured patients, PD utilization at the time of ESRD onset would require patients to receive education and preparation for PD treatment, including PD catheter placement before initiation of PD. Logistics like these may be challenging/difficult to achieve in patients who have no health insurance. As mentioned in the introduction, additional factors play a role for underutilization of PD in the US. In addition to health insurance, several patient (preference, life-style or work-related needs, lack or limited home/family support, etc.) and physician factors play an important role in the choice for dialysis modality in the US. It is important not only to recognize these factors but also to take several measures to enhance PD utilization in the US. Enhanced exposure and training of fellows in PD during fellowship may be one such measure. Fellowship program directors and the training community need to ensure that all trainees receive adequate training in PD during fellowship and that they feel comfortable in offering this option to patients. Implementation of urgent-start PD programs would be another measure that may result in increased utilization of PD in the US, although this is not available at all training programs/hospitals. In addition, fellowship training should cover education and discussion on health insurance policies, including Medicare’s coverage of patients with ESRD (see the work that NBLU has done here). Finally, another important measure would be to enhance patient education and understanding of the various dialysis modalities. Augmented nurse care management in CKD stages 4 and 5 has been shown to improve patient education and preparation for various ESRD treatment options (AJKDBlog interview here). In a randomized trial, PD was the initial ESRD treatment in 7 of 30 (23%) participants receiving augmented nurse care management versus only 1 of 29 (3%) receiving usual nephrology care. When you look at the global landscape of PD, the US is falling behind. Even in developed countries, the US rate of 7% demonstrates underutilization of an option that offers distinct advantages to traditional hemodialysis. Insurance coverage (or lack thereof) is another limiting factor that providers need to be aware of when having conversations about dialysis therapy. 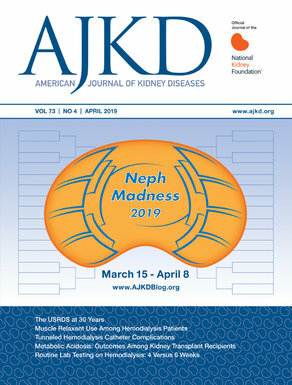 To view Perez et al (subscription required), please visit AJKD.org.